In this simulation game, you are an air traffic controller at the approach radar of a busy airport. 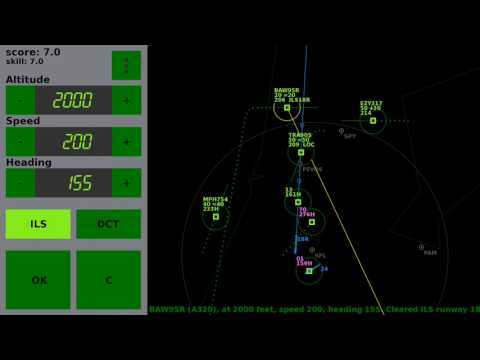 The goal is to guide the planes safely to the ILS (Instrument Landing System) of the runways to get a high score. If you make no errors, the number of planes you have to control gets larger and larger. How many flights at a time can you handle? The game shows you a radar screen with planes and runways. Planes are generated randomly. To keep it fun and playable, this ATC sim is a bit simplified compared to real life, but it's all on scale and the planes behave realistically. (3) the plane must intercept the ILS at a heading of 50 degrees or less with respect to the runway (aim for about 30 degrees). If captured correctly, it will follow the line and land automatically on the runway. Note that it takes some time for a plane to descend to the selected altitude. When a plane is fully established, it will be handed over the the tower and then you score skill points. For parallel approaches, maintain 1000 feet vertical separation until both planes are localizer established. • Departing aircraft determine their heading and speed themselves; they only require an instruction (when it's safe) to climb to a higher altitude: flight level 130. • The amount of planes that you have to control is about the same as the amount of skill points you have: the higher the skill value, the more planes you have to deal with. You can also achieve 'goals' by landing a certain amount of planes in the correct way. • Some planes have an additional 'RD' tag; only these planes need to land on the secondary 'RD' airport. In the menu there are options like a speed multiplier, and a 'skill cap' for a more relaxed gameplay: this 'cap' limits the skill value so the rate of inbound traffic will also be limited. 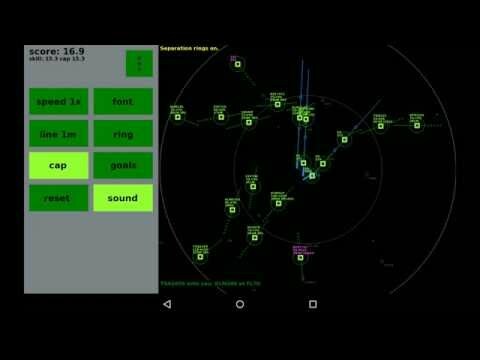 Set sound mode to 2 or 3 for pilot speech via android TTS (uses US and UK language). The game plays best on big screens. If you have feedback, please send me an email. - Wake turbulence distance is more clearly displayed; the arcs have a better visibility and the required distance is also given in the infotext line when a plane is on approach. - Increased the amount of traffic to the secondary airport. - 3.9.5: Added mouse support. - More departures from secondary airport 'RD' when flow mode is enabled (after setting a high skill value first). Several other minor traffic adjustments. - Flow limit increased to 180 planes per hour. - Added multiwindow support (android 7+) to allow for multitasking; only useful on large screens. - added more wake turbulence categories ('recat'), allowing for more efficient wake turbulence separation on the localizer (less go arounds). - wake arc on the localizer will adapt dynamically to the required distance between two plane categories (instead of always displaying two arcs for 'H' and 'M' category distance). - planes inbound 'RD' airport have a slightly different label color, so they're easier to distinguish from planes inbound to main airport. - More customizable traffic rate: options to adjust cap and skill level, or set a fixed flow of traffic, or disable traffic to the secondary airport. - More display settings: range rings and XL font size. - Several bugfixes and adjustments. For more variation and challenge: the full version now has Tokyo and Toronto airports, and customizable weather. v3.4:- added two finger pan/zoom- green text at the bottom now fits on screen, and the blue text of a selected plane remains visible till OK is clicked- no auto altitude change anymore when enabling SID mode- added warning message before Cap is enabled for the first time- yellow wake arcs for clarityBy the way, the full version (with five more airports), is now on sale! v3.2.3:- easier expediting climb, by doubletapping in the middle between the altitude buttons- full aircraft trail now always stored on exit/app switch- slightly more departures- and other minor bugfixes/adjustmentsP.s. the full version is now 33% off! v3.2.0:- more departures- added label background when a plane is selected, for better visibility- reduced separation requirements during simultaneous takeoffs, and shortly after go-arounds to avoid double penalties.- several minor adjustmentsAlso, the game is now available on Steam too.